I received Meccano Outfit No. 1 as a youngster of about 8, as a Christmas present and for the next successive years an "A" set to build it up to the equivalent of a set 7. I received various bits and pieces from my parents friends whose boys had stop using it. I introduced my kids to Meccano in the early '90's but it didn't really catch on. There may be some girl and women enthusiasts but they weren't going to be in my family. Over the recent years, I have received a fair number of the new sets (Multi-Models or singles) and have had fun building them, especially with some of the grandchildren. I've even taken to buying a small model, taking it to a pub along with some friends, and having a Meccano Pub lunch. All present take turns putting the model together while enjoying the food, drink and ambiance. Finally, after years of mostly tongue-in-cheek requests for a Christmas or birthday present of an Outfit 10, I received an inheritance and used some of it to fulfill this life-long desire. 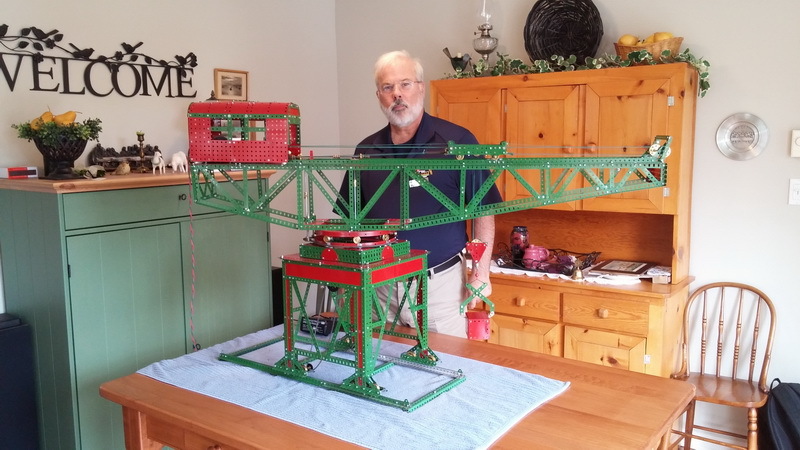 The 100th Anniversary Block Setting Crane is the first endeavour at a large model in over 45 years. With the help of several online writers or bloggers, I learned some of the issues with this particular model and dutifully repeated them, while coming up with some modifications to help it run better or for my own sense of aesthetics. The following pictures will elaborate on these. While visiting a Collectibles Fair this past Fall, I met Mr. Brian Lillie, a Meccanoman and seller of parts. He had put together some kits for sale that would make up a model. One of these was from the 1955 No. 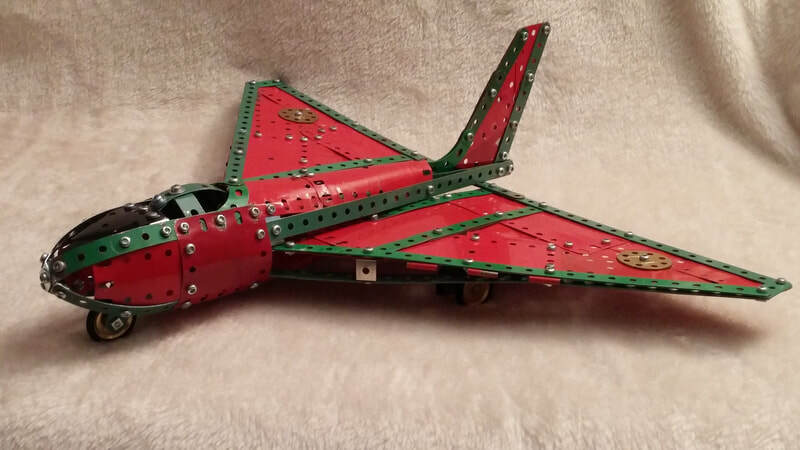 5 Outfit, Model 5.13 Delta Wing Jet Aero Plane. Hadn't seen the model before, so went off to find it and subsequently build it. My plate roller came in handy for the many curved plates and strips. The hardest part despite rolling plates about as tight as I could get them was getting the upper and lower rear fuselage to come together and marry-up with the wings. I added an extra wheel to both under-wing landing gear just to bring it up to date a bit. I also had thoughts of modifying it into several other delta wing aircraft of the time such as the Avro Arrow. That will be for a later day. My kids found a double valise set at Costco a couple of years ago and gave it to me for Christmas, which was just great. I had seen the same sets earlier and bought one myself. My grandson, Gregory comes over just about every month and took a shine to the "Blue Rail" car, which I subsequently helped him build. When that was done, I went through the "red book" of the set and came up with the Dune Buggy shown here. I intended to race Gregory's Rail (making sure that each car had new batteries, of course), however snow got in the way, so it'll be a week or so until the next opportunity for a meet. The model goes together very well and offered no challenges to my short, stubby fingers. 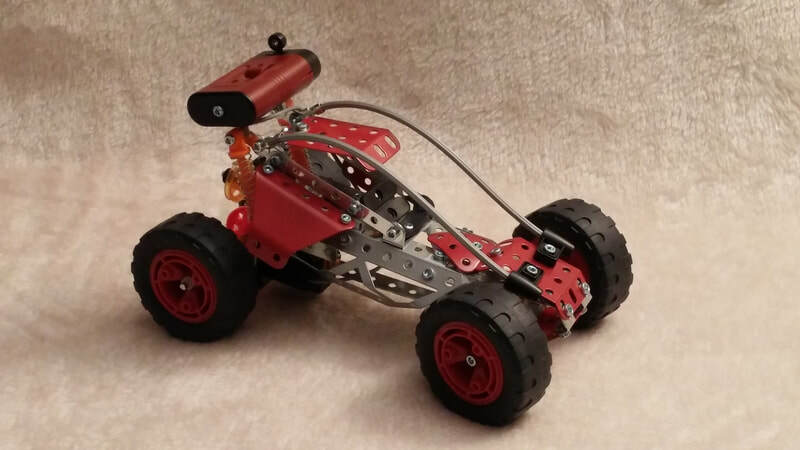 It travels well across a hardwood floor although the tracking is a bit sloppy since the rack and pinion steering is loose. This point may give a bit of the advantage to the Rail. Hmm, perhaps I shouldn't update its batteries. I picked this kit up from Used Victoria in the late Summer but, like a lot of things, it sat idle for a few months until I could get around to it. I was actually reluctant to undertake the project because I find a lot of these newer kits have so much plastic and are conglomerations of parts lacking anything to do with real world engineering. 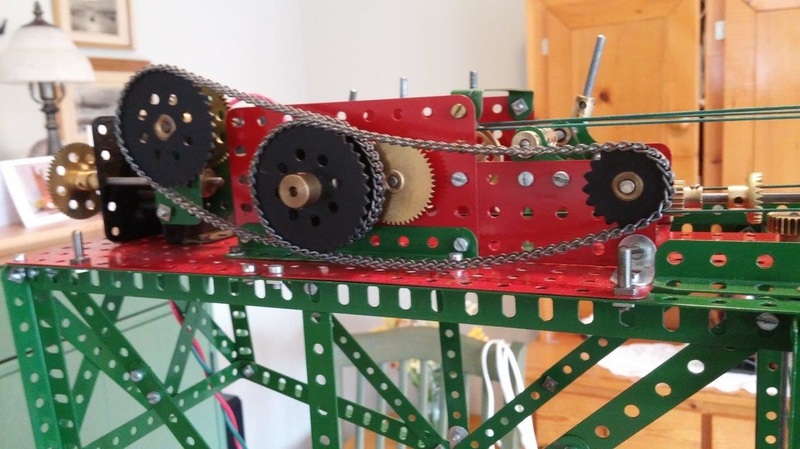 Please note that I'm not an engineer (much to my Grandfather's dismay), however, I have found the principles taught through building with Meccano are seen everywhere in the greater world. 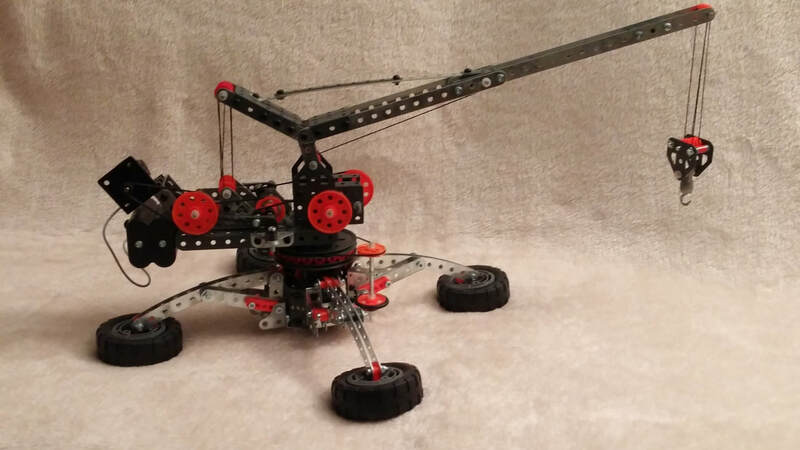 Well, having said that, I discovered, hence the name of the photo, Spyder Cranes that manufacture machines of varying size that I can only think was the inspiration for this model. My grandson, Gregory enjoyed showing me how powerful it was being able to lift without any difficulty at all the aircraft model from set 5550. The actions were smooth and realistic. I was also surprised to find that the leg articulation emulated the Spyder crane's capability. 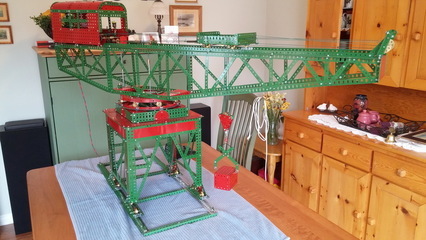 A fine addition to a long history of cranes in Meccano. The next series of pictures shows some variations worked into the model, some of them are mine and some are Jim Picton's. 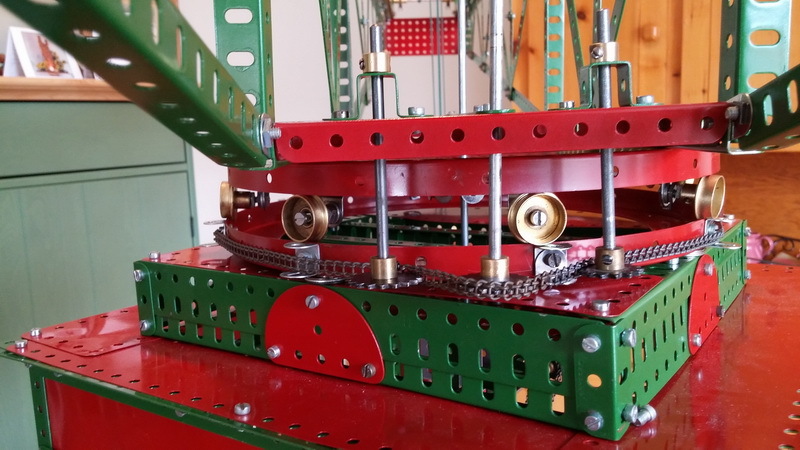 As Jim pointed out the original design for the boom's roller bearing proved to be unstable especially when the trolley and block moved outward along the boom. By turning the flanged ring (167a) over to create a more stable bearing, other issues arise concerning anchoring the lower ring to the tower and the upper ring to the boom. The lower ring was no longer attached by fish plates but bolted directly to the tower. In order to clear some of the bolt heads in the top deck of the tower, 4 washers were stacked as spacers. 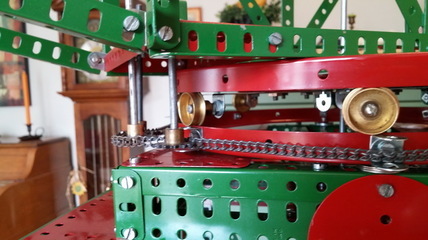 Another modification required was to tension the chain around the lower part of the bearing so that it would not slip. 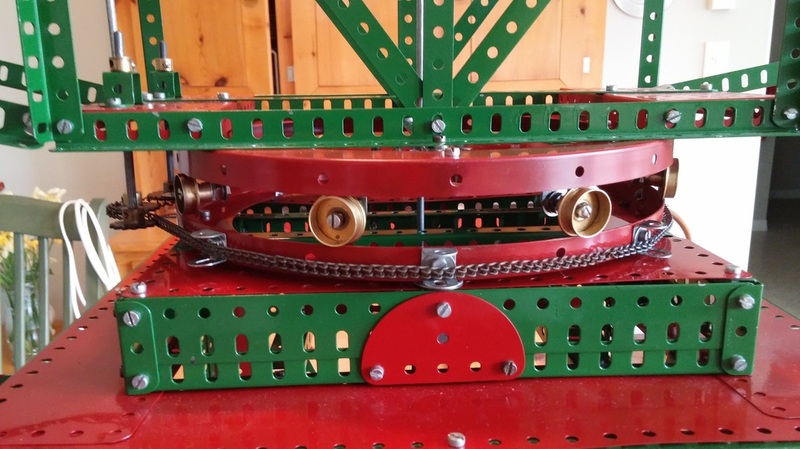 I had seen a machine that had a sprocket chain drive that ran through a series of sprockets to maintain tension. So, I adapted two spare sprockets (part nos. 96 & 96a) to the purpose. Initially, I tried two no. 96 sprockets but that proved to be too much tension, so I replaced one with a 96a. The chain slips occasionally but works as it is intended most of the time. 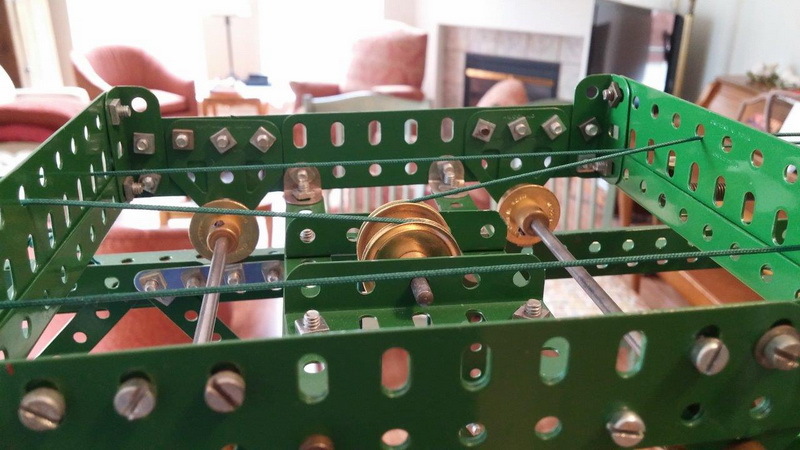 One last modification designed to make the movement of the boom a bit faster was to change the gear ratio of the training and wheel drive sprockets. Unfortunately, this didn't improve the lack of motive power reaching the wheels it did have an effect on the slewing mechanism by reducing the amount of chain slippage. One issue that arose when the training and movement drive shaft was engaged was the tendency of the shaft to flex and come out of train at the gearing. I had removed a double bent strip that spanned the boom and through which the drive shaft was to pass because of irreconcilable alignment issues. That introduced the rod flexing problem. So I dug into my box of pieces and came up with a 1.5" x 1.5" plate (no. 74) bolted to two reverse angle brackets and then subsequently bolted to built-up cross brace comprising a 5.5" strip (no. 2a) and a 4.5" angle girder. 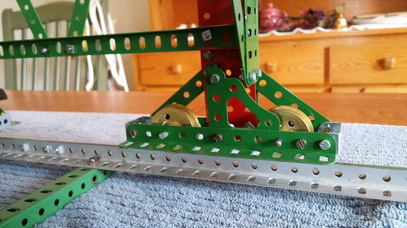 The slotted holes in both the girder and the reverse angle bracket allowed for fine adjustment of the plate, which enhanced shaft motion while dampening its flexing. The original design of the bogies included rubber tyres, however, I saw the plans for the next size up crane had rail wheels, so I decided to modify the design further. I replaced the 1" pulleys and tyres with no. 20 Flanged Wheels facing an 8-holed Bush wheel (no. 24). This made the bogies wider, so I used 8 x no. 48e double angle brackets to span the gap. The inside corner gusset (no.108) was supported at its upper end to the leg of the tower by a 1" reverse angle bracket (no. 124). With every modification a new problem can arise and so it happened that by using all the the flanged wheels in the bogies (actually twice as many as comes with a set 10), I created that problem when it came to building the trolley. I knew it would happen and planned to simply substitute no. 120b flanged wheels. That would have left the trolley a bit too low on the tracks so I adjusted for that by inserting no. 126a Flat trunnions into the structure. The result worked out very well. I also added a couple of threaded pins (no. 115) to the inboard end of the trolley and slid the springs over them and securing the springs with collars, as an aesthetic improvement over bits of cord and knots. Lastly, I caught a comment in Jim's write-up about fixing the cab by pins. 4 x no.115 threaded pins located along the angle girders in the area of the cab made it very easy to lift the cab off during the "set-to-work" period of construction. Its been a thrill to get back to serious Meccano modelling after so many years. I'll fiddle with the crane a bit more to see if the movement issue can be resolved and then deconstruct and start another project.